Jim Gannon: Yeovil will be a "great test" for young team. Jim Gannon: County showed discipline against Curzon, Yeovil will be a “great test”. Stockport County manager Jim Gannon speaks to 104.9 Imagine FM presenter Chris Ridgway about the win away at Chorley, the win at Warrington in the Cheshire Senior Cup and the trip to Yeovil in the FA Cup. The Hatters make the journey down south on Saturday in the first round proper of the prestigious competition. Yeovil sit two divisions above Stockport County in League One, but boss Jim Gannon has confidence in his men. In a bonus special feature this week, Chris caught up with new signing Elliot Osborne, who turned his loan move permanent earlier this week. “This has been coming for a long time, and it’s great to actually get it officially done on a permanent basis, which i’m buzzing about. With the history of the club and how the fans are with the players, I’ve never been at a club like it. It’s a great club and I’m buzzing to be back”. 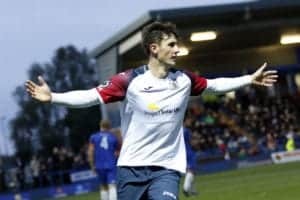 Following the conversation with Jim Gannon, hosts Chris Ridgway and Martin Johnston of 104.9 Imagine FM pick over another week in the lives of Stockport County fans, the ups and downs and the highs and lows. Chris and Martin also picked their ‘one to watch’ for the Yeovil game. As usual they also decided who was ‘da man’ in Stockport County’s win against Curzon, this week Jordan Keane scooping the coveted prize. Don’t forget that as always, Chris Ridgway joins Jon Keighren this Saturday on 104.9 Imagine FM and around the world on County Player for full match commentary and all the coverage of Stockport County in the Vanarama National League North.